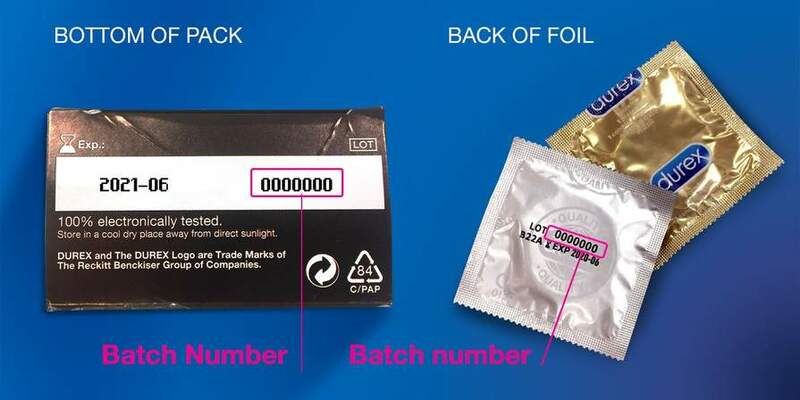 Durex have recalled specific batches of their Real Feel and Durex Latex free condoms over fears that they may split or explode when nearing the end of their expiry date. No other batches affected but you might want to check your stash as you don't want to be caught short shall we say! 1. What exactly is the issue with these condoms?The safety of our consumers always comes first, and this is reflected in our rigorous quality standards. We recently found that a limited number of the above condoms made earlier this year are not passing our stringent shelf-life durability tests. Our tests have shown that some batches which are currently on the market in UK & Ireland do not pass the requirements for burst pressure towards the end of the shelf life for the product. The expiry date of the affected batches is between Dec. 2020 and Feb. 2021. Only for the batches of condoms affected by this issue, there could be an increase in the number of condoms that burst during application or use. @splatsplatsplat - I can't help but find your appearance within this thread entirely appropriate for the alert being raised. To the moderation team, I say, thank you for keeping us all safe out there. Wonder how they found out. thanks for the massve savings on nappies and headache pills. Here come the complaints from mums who say they thought they were protected but in fact they didn't use one anyway, just to get compo. Here come the complaints from mums who say they thought they were …Here come the complaints from mums who say they thought they were protected but in fact they didn't use one anyway, just to get compo. Wouldn’t you need to give them the broken one to prove it ? Hmmmm, there's me thinking how to put a hole in one now. This might cause a few relationships to split!!! It's supposed to go in a hole!!! What if it is too late! !